We have already discussed having some problems in the STL file you are going to be printing, even though they may not be visible when previewing the model, can often lead to problems when you start 3D printing. 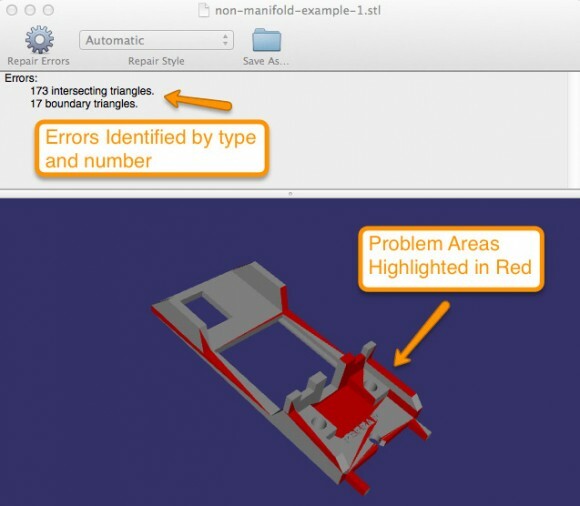 The fact that the different errors in the 3D model that you want to print might not be visible to the naked eye makes it hard to identify them and fix them before attempting to print. There are software solutions available that can help you address such problems by trying to automatically find more common errors and correct them thus saving you time and frustration why a certain model does not want to print properly. One such solution is the Emendo STL Validation and Repair Software that can provide you with an automated method for validating STL for use on a 3D printer. STL files define the surface of the part to be printed, so if there is a hole, or inconsistency in the surface such as a “zero thickness wall”, a 3D printer will have difficulty in printing the object as it was designed. Emendo provides the user with a 3D view of the file, highlighting the location and type of errors found in the file. This also helps users learn how to design better CAD files, and also locates the cause of problems that require manual re-design before printing. Some 3D printing problems relate to the method of design used in third party CAD applications and require revision with that application. The only drawback is that currently the Emendo STL Validation and Repair Software is only available for Mac OS and it requires Mac OS 10.9 or better to be used, though the developers of the software do say that a Windows version is planned for the first half of 2015. The software is not free, you need to buy a license to use it and will cost you $49.95 USD, a small price to pay if it can save you hours of work and headaches caused by problems with STL models that you want to print on your 3D printer.